University of Michigan Press, 9780472109135, 192pp. Thomas Heywood (ca 1573-1641) was a major Renaissance playwright who wrote or collaborated on over two hundred plays. Loues Schoole was one of his many nondramatic works that shows his fascination with antiquity. It was the standard English translation of the Ars in the seventeenth century, so popular that it was pirated almost as soon as he had written it--then printed, sold, reprinted, and resold in England and the Netherlands. It was not attributed to him during his lifetime, and he was not allowed to share in the profits that its (considerable) sales generated, two things that rankled him for the rest of his life. This is understandable because it is an excellent translation into English heroic verse, accurate without stuffiness, colloquial without indecorousness. Twenty years after Heywood's death, Loues Schoole was pirated yet again and went to six different editions during the Restoration (1662-84). The present edition represents the first instance in which the translation has been edited in a scholarly manner. Besides a full Introduction that accounts for the history of Loues Schoole, Ovid in the English Renaissance, and the editorial method, each of the three books of the poem includes a Commentary that provides cross-references within the text; glosses for unusual, archaic, or regional forms peculiar to Heywood's English; annotations from sourcebooks that Heywood used to identify or understand characters from classical history, literature, and mythology; and explanations for any emendations the editor deemed necessary. 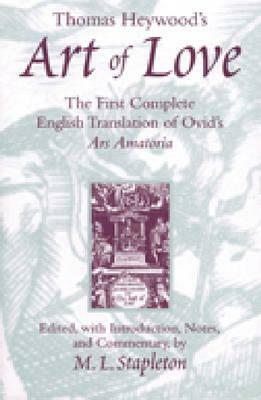 In his efforts to make the Ars a seventeenth-century poem, Heywood contemporizes Ovid's references to dress, behavior, courtship, marriage, games, theater, agriculture, horsemanship, war, literature --all of which the Commentary explains at great length. Loues Schoole will find readership in these areas: early modern history, literature, and culture; classical studies; Renaissance drama; the history of sexuality; and translation theory. M. L. Stapleton is Associate Professor of English and Philosophy, Stephen F. Austin State University.